Manchester based Sustainability Inc commissioned Specialist UK Restorations to undertake façade restoration works to The Old Post Office, a Grade II listed building on The Esplanade in Rochdale, Manchester. 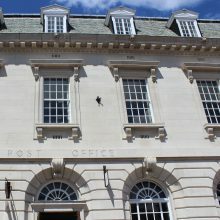 The Georgian Post Office was designed by the Post Office’s own architect, Charles Wilkinson. It had been proposed as early as 1911, but due to World War I it was not completed until July 1927. As a Stonehealth approved contractor we carried out the cleaning of the Portland Stone façade using the DOFF system, a steam based stone cleaning system. The steam/superheated water removed moss, algae, fungi and other biological matter whilst also killing off spores. This meant there was no need to use a chemical biocide during the removal process. DOFF cleans stonework and masonry using high temperature steam. When the temperature in the system is high the pressure on the surface being cleaned is very gentle and the volume of water is low. The surface was therefore not saturated and was once again dry within minutes. With the cleaning complete SUKR also carried out external building repairs including rake out and renewal to defective sections of burnt sand mastic to the perimeter of the windows, raking out to a depth of 20mm all friable mortar to the stone joints and reapplication in a specification matching the surrounding areas. The full fabric was then painted in a protective coating of a clear water repellent impregnation to offer additional protection against future water ingress. The product chosen offered a solvent free solution and has been specially developed to provide highly effective long lasting protection on Natural Stone and Mineral Surfaces. Importantly, particularly when using on expensive high quality Natural Stone, is totally invisible and will not change the colour or appearance of the stone.